Plans to build new nuclear power stations in the UK have suffered another setback after Hitachi announced it is suspending projects in Anglesey and Gloucestershire. Today’s announcement follows speculation that Hitachi would put its nuclear development plans on hold in England and Wales after failing to negotiate a deal with the government on financing the projects. Wylfa Newydd nuclear plant on Anglesey in North Wales and Oldbury on Severn in South Gloucestershire were being developed by Horizon Nuclear Power, which was acquired by Hitachi in 2012. The company had planned to develop at least 5,800MW of new nuclear power across the sites. Both sites would have created around 850 full-time positions and 9,000 jobs at the peak of construction. Commenting on today’s announcement about Wylfa Newydd, Jenifer Baxter, head of Engineering at the Institution of Mechanical Engineers, said: “This is sad news for North Wales and the UK energy industry. The construction of the plant, and its operation, were expected to provide hundreds of highly skilled engineering apprenticeships and jobs in North Wales for decades to come. This is an area with few of these well-paid jobs and this plant would provide an important economic boost to North Wales. 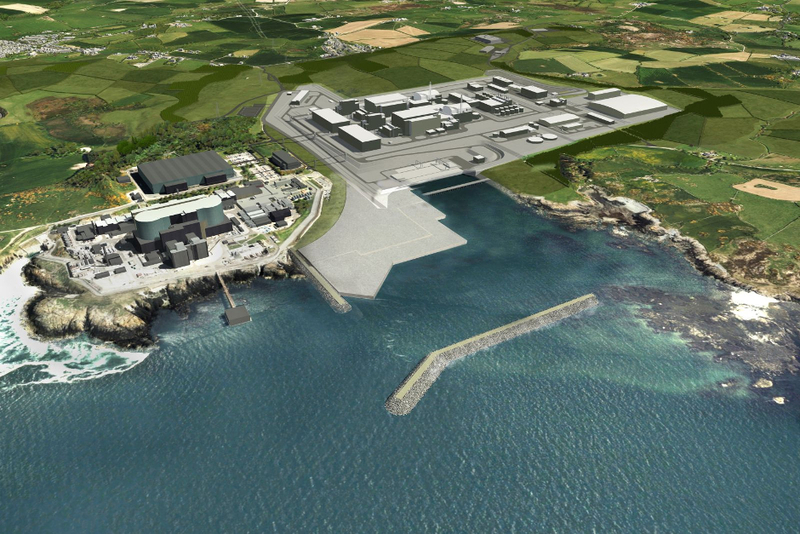 Today’s news is the latest setback for nuclear new build in Britain. In November 2018 Toshiba wound up NuGen, the company set up to build up to 3.6GW on land in Moorside, West Cumbria at a cost of around £10bn. Totally agree with Prof. Sue. Responsibility and risk should lie with those who benefit from the investment. In this case it is Hitachi and UK(PLC). You cannot expect the developer to carry all the risk when compensation for the realisation of any problems only occurs decades down the line. Interest on any sums paid to cover unforeseen costs only makes the matter worse and inflates everyone’s budget. When it comes to multi-billion pound budgets very few private enterprizes have the pockets and staying power to see things through to the end. And if they can: they’ll charge you through the nose for putting their business at risk. The Government must get involved, carry the risks and reap the rewards. When this story was breaking there was reference to the UK’s energy strategy. Can someone tell me what this is? Now there’s a surprise! Just one more (actually several) chicken coming home to roost. And, so we have been told, ‘we’ are allegedly the world leaders in banking, financing of long term infrastructure, and so on. Have we yet again been sold a Right ‘pup! I believe we should be told, and all the story this time, before the vote? To my mind, this is another reason why the UK shouldn’t put it’s strategic industries in the hands of foreign companies. Maybe this could be an opportunity to seriously look at SMRs rather than these expensive, “all your eggs in one basket”, mega reactors. Professor Ion is so so right. (small r) Capitalism surely works when those who seek the greatest benefit assume the greatest risk! Yes, I accept that there are some elements of infrastructure for which only HMG has the resources to fully implement. But it appears that these fly-by-night folk want the first without the second. When the lights go out, don’t tell me that they are too big to fail! That only applies to banks!? For gods sake UK, build it yourselves, you have vast resources of technology, build a Thorium reactor, develop the technology for that, stop pandering to other countries and the EU. This is in the national interest and should be funded that way! I am of the impression that the consortias that built the original nuclear power plants are now either defunct or were acquired by foreign-based multinationals. So are there any British-owned companies that still have the expertise to build the next generation of power stations? If there are none, we will have to continue relying upon foreign assistance. I would like to say that it is fundamentalist marketeers that believe it should be left to “free enterprise” – but I suspect that , cross-party, ignorance of (especially) manufacturing technology and innovation is rampant. There is the idea that we should invest in technologies that are high value – but this seems to be confused with using expensive technology to make expensive things. Whereas making appropriate technology affordable might be the best approach – and research how to make it. Recently I saw an article about sensible thermal (energy) storage. This requires the same technology as pressure vessels for nuclear power – affordable , robust, thermally insulating and with a high temperature capability; but this does not seem to be relevant (or technology is possibly unknown) to government planners and they just seem to think that old fashioned and off-the shelf will be something that they can buy-in. Of course big companies do not want to take risks and are happy to use old fashioned designs and technologies – and they can make more money off expensive designs (expensive to manufacture that is) – I believe this is also an issue in the US military- with eye-watering costs (& extra value?) for some of their systems. I am sure the expertise exists for development of manufacturing – but the government needs to accept that they should support scientist to develop innovative technologies – and the start-ups to so do. I think that they have been ignoring state of the art innovation in technology for some time and many of those would benefit energy storage as well as making new nuclear designs – by addressing manufacturing capability (and that is without going into any development of new materials – but things like advanced insulation and high temperature pressure vessels) – and using available generating systems (eg gas heat exchangers feeding gas turbines and thence steam turbines). Construction technologies do not seem to be making significant improvements – against the difficulty of offshore construction – but I think that is regardless and until management techniques allow innovation for affordability (eg HS2) then that is another issue. it is fundamentalist marketeers that believe it should be left to “free enterprise” – but I suspect that , cross-party, ignorance of (especially) manufacturing technology and innovation is rampant. Go a little deeper into comments of this type, and you will find that the only groups of people who spout about market-forces (and indeed the advantages of a democratic?system) are those who have cleverly insulated themselves (and what they hold the monopoly of offering) from both. Deal with that and who knows…. Long-term high cost projects for a countries infrastructure should certainly be matters for national funding. The massive French programme over 40 years ago was such a case. The need for base-load reliable power is made very clear in UK winter months when the wind and solar are next to useless and more nuisance than benefit. Without the nuclear stations and old coal stations we would be having power cuts now. Renewables can only supply a small percentage of power economically, above about 20% the cost of storage and back-up becomes crippling, as Germany and China have already found. The reducing cost of windmills is oft cited as proving their economy, but the economics of wind generation depend on being paid curtailment fees when the power cannot be used and being given priority on the grid that penalise other power sources. In a short while the UK will be totally dependent upon imported gas and our economy will then be totally at the mercy of the volatility of the oil market. As Mr. Mortimer noted above “What energy policy”??? Will the Chinese be next to have an influence on our Nuclear Builds i.e. Hinkley Point ?